Ann Farnum Curtis and a group of dedicated volunteers created the Lake Ronkonkoma Historical Society's in 1976. The group's mission was to preserve the history of the Lake Ronkonkoma area. Ann wrote and published a history of the area titled "Three Waves - The Story of Lake Ronkonkoma", released in 1976, and decreed that all revenue from sales of the book forever to be used to support the organization. 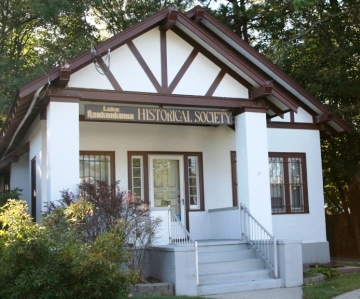 She then convinced the Sachem Public Library to lease the vacant 1916 Ronkonkoma Free Library building to her newly formed Historical Society. After a two-year renovation, the Lake Ronkonkoma Historical Society Museum opened to the public in May of 1978. The Museum's large collection of vintage photographs and historical items were donated by Ronkonkoma area residents. The building is open year round for tours. We are open on Saturdays 10:00am to 2:00pm or by appointment. We also host historical programs for school groups, scout groups and senior groups. We can also present historical programs at other locations. Call us for more information. In 1995, Katherine Kenneth, the last surviving member of the family of local resident Fitz-Greene Hallock, donated the Hallock Homestead to the Historical Society for use as a museum. It is located on Pond Road in Ronkonkoma. 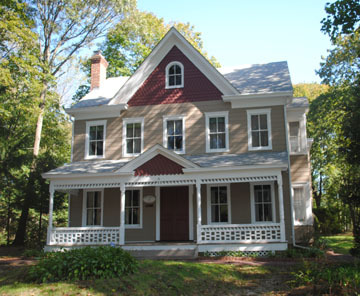 The house, named "The Maples" by the Hallock family was built in 1888. It was donated witl ALL the original furnishings inside. It is a time capsule into the life of a late 1800's Long Island family. The house is open for tours and events throughout the year. Historical Society members get a special behind-the-scenes look on tour days. The outside yard features a beautiful croquet court, which can be leased out for special events.